90 years ago, Paul Legueu was born. If his father René Legueu laid the foundations of the company philosophy by creating Ateliers Legueu de Meaux (ALM), it is to Paul that ACMAT owes its existence. Specialising in all terrain trucks intended for the colonies, the production of ALM fell sharply with the end of the colonial era causing the company to file for bankruptcy. After the death of his father and expropriation of the site at Meaux, Paul moved the company to St Nazaire forming the company Ateliers de Construction Mécanique de l'Atlantique (ACMAT) in 1966. 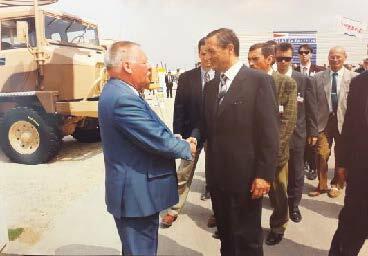 Paul Legueu presents the ACMAT Stand to the Minister of Defence François Léotard at the Eurosatory Exhibition of 1994. With energy and determination, and taking his inspiration from the truck models manufactured by his father, he reduced the product range and oriented it towards the military export market. He transformed the VCOMs (overseas combat vehicles) into VLRAs (reconnaissance and support liaison vehicles) adapted to fulfil the needs of the young armies formed with the coming of independence. The VLRA was based on principles of robustness, ease of maintenance, modularity and continuity. In 1982, a journalist described Paul Legueu as "Stocky, purposeful, carved from a framework of obstinacy that has been twenty years in the making; Mr Legueu is a happy industrialist. Happy in having a good product, good customers and a good workforce".